Tiny Titan needs your help! Aw Yeah! A benefit art concert. If you are looking for an event this weekend that involves music, art, and massages all in the name of charity, then do I have an event for you! This Saturday, Cornerstone Banquets in Darien IL, will be hosting a benefit fund raising concert for Ashley Baltazar, 19, who recently suffered a debilitating brain aneurysm. In efforts to alleviate some of the medical costs that Ashley’s family has accrued over the recent months, DC-Tiny Titans artist Art Baltazar, along with some of his comic book friends that will draw and paint for donations. The guest list includes some DC, MARVEL, and Devil’s Due artists such as Mike Norton, Tim Seeley and Patrick Brower. If you are an artist who is interested in expanding your sketchbook, Art will provide the boards. All you have to do is bring your own markers, paints, or crayons. So if you are interested in assisting with the cause, meeting with local artists, or simply rocking the burbs with local Chicago band The Houseboyz, now is your chance! Along with original art pieces there will be live and silent auctions for trips,vacations, gift baskets, and they will even serve dessert! There is a $10 cover and if you have your own tiny titan that is either 12 or under, admission is free. interesting people such as Green Lantern, Super-Man and R2-D2, playing free games ,and getting tons of comics from companies such as Marvel ,DC, Top Cow, Devils Due , and Legion Studios. Today is the final day of the convention and your chance to see an encore presentation of Batman Gotham Knight ,enter the kids costume contest , or play a friendly game of Guitar Hero or Rockband. As you make your through the aisles of comics, toys, and vendors,you will find an alley of artist who are waiting to sketch you a tiny titan, or whatever your heart desires. So come on down and make your way through a Dungeon of Dragons or an array of vendors where you can get a Hero action figure or your very own Tecnhics vs Marvel T-shirt. For those of you who are not able to make it to the convention, (kids 10 and under are free), I will post a video and show you my favorite highlights of the con, including a cameo appearance from Lou Ferrigno himself! Until then stay tuned, same Bat-time, same Bat-channel. Have No Fear, Comic Con Is Here! 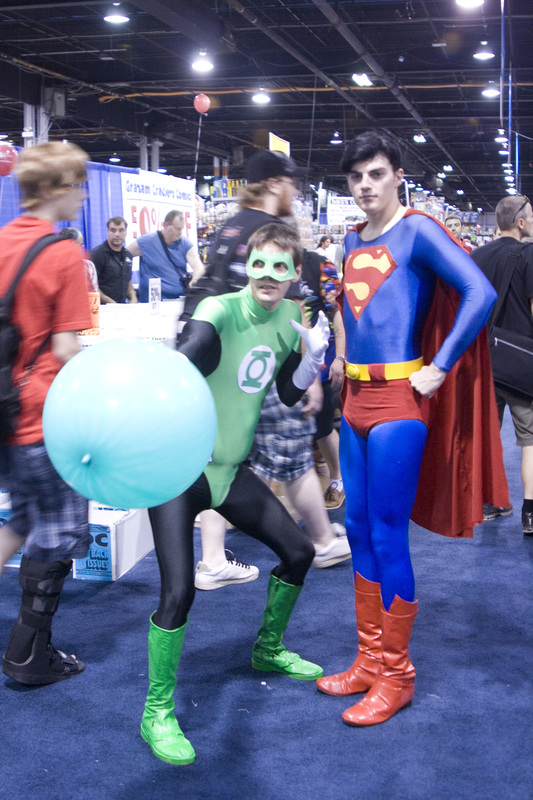 Whether you are a kid, or just a kid at heart, you will find plenty of things to do this weekend at Wizard World Chicago. This all- age extravaganza offers comic and non-comic book fans an insight into the comics world involving more than just buying/trading comics and toys. Wizard World offers aspiring artists and fans an opportunity to learn the tricks of the trade, get the inside scoop on future movie releases, video games and publishing companies such as Marvel, DC & local Chicago company Devils Due. Guests will also have the opportunity to meet the original Hulk himself, Lou Ferrigno, actress and Maxim hottie Missy Peregrym, as well as industry moguls such as Alex Ross, Tod Mcfarlane, and Warren Ellis. While artists, inkers, and writers show off their skills, sell original sketches, art, or books in artist alley, I will be hanging out at Player’s Paradise, checking out as many video game demos and tournaments as humanly possible, attending panel discussions, workshops, and signings, and be at the premiere of Batman Gotham Night. When I run out of money to spend, I might sign up for the costume contest, where eligible winners can receive up to $1,000 in prizes. Or maybe I will just collect as many free giveaways as I can including buttons, posters, and comics. So if you find yourself near Donald E. Stevens Convention Center, June 26-29, with costumes in hand, come on down and experience the largest multimedia popular arts convention in Illinois. Be sure to stop by artist alley where you can mingle with or purchase work form local artists such Eric Jimenez, Art Baltazar,Gregory Titus, and Mike Norton. Although Wizard World is considered to be an all ages event, kids day is on Sunday. By creating an in-store and on-line experience, proprietors Dal Bush and Patrick Brower are bringing the entire community — including Bucktown and Logan square — to get involved in what’s great about comics, Comics + Conversation. As soon I walked in the store, I felt as if I was literally stepping foot into a page of comic book! The store is saturated in reds, and the windows are animated with art from local artists such as Tim Seeley, Mike Norton, Scottie Young, Chris Giarrusso’s, and Art Baltazar. The center aisle is home base to mainstream and independent comics, while the graphic novels are guarded on the back shelves by legends such as Iron Man and Spiderman. As I made my way through and around the store (which took me about four hours,) I began to re-visit the 80s child within myself, and found myself at the art table in the back where I created a masterpiece of stick figures (I should have read the “how to” sections behind me). 17 years in the making, Challengers is providing the community with a small store atmosphere that you can really feel like you are a part of. Both Patrick and Dal are allowing the community to do something that you can’t do through websites and larger stores — allowing them to both buy and be excited about comics as much as they are. Only after visiting the store, customers are able to sign up for the challengers website where they can talk about comics, post reviews, check out upcoming events, or spend countless amounts of hours staring at the Challenger’s store web cam. Challenger’s has a fresh new perspective of putting the fun back into comics and meeting new people along the way. So long gone are the days of bickering with fellow comic book fans on which is better, DC or Marvel, you can now battle it out on the intranet. Who knows, you just might run into them at the store! Don’t forget to graffiti the wall on the way out and to stop by the store on June 18 for DC Comics “TRINITY“ signing with Chicago’s own Mike Norton. Check out Newsarama’s exclusive preview of artist pages for DC’s Trinity # 3.